Lovely square notecard featuring a print of an original multi-layered acrylic painting. 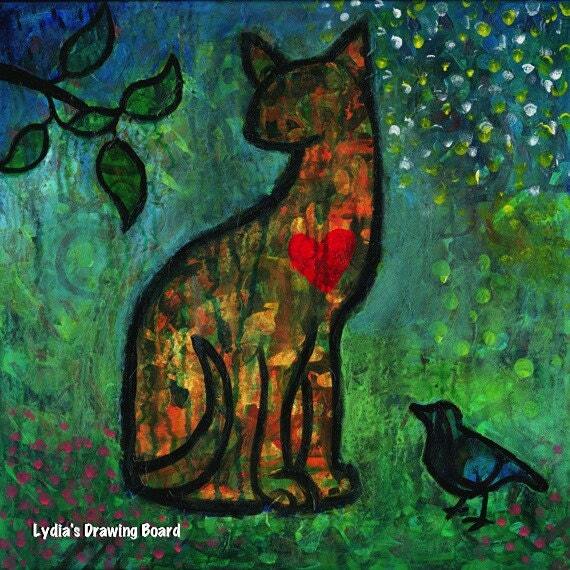 This painting is of a cat with a big heart and an admiring blue bird. The size is 5 1/4" x 5 1/4", printed on quality white matte notecard using an Epson Stylus Pro 3880 and archival inks. Comes with matching envelope There is a tiny white border, and the watermark will not appear on the card. Signed and suitable for framing. © 2012 Lydia A. Eloff. All artwork is subject to copyright and not authorized for use without prior permission. All rights reserved.